Location: My chair in front of the computer. Comments: All this talk about Mexican food is making me hungry. I guess El Chico is a national chain. They had those when I lived back in Kentucky. It was the first restaurant I visited that had "real" Mexican food instead of fast food. Too bad Tulsa doesn't have a "Taco John's." They have them in several states, and it's a bit better than the "Taco Bueno" restuarants that are around here. MMM. Casa Bonita. I like eating there, but I don't go very often because I always eat so much when I'm there that I'm miserable for days. When I moved here, I didn't know what that place was until a good friend took me there one day, and asked the waiter to seat us in the "cave" section. I felt a bit confused and puzzled until we got to the section that was like a real cave. I think I'm almost ready to go back. So, do any of the regular contributors to this guestbook and site ever get together once and a while for dinner? Comments: I am glad that Jim Ruddle brought up Mexican food because it has been badly abused by some from its original authentic roots. I grew up in Arlington, Texas and remember the many Mexican restaurants in the Dallas-Fort Worth area. All of them made everything "in house" and it was wonderful. Nothing ran together on the plate. When I came to Tulsa in 1957, it was much the same and the really good places had been here for some time. I remember a place on 15th Street (just east of Atlanta) run by a fellow named Victor Mendoza. He played a fair guitar and sang. Alas, a better singer than owner. He later played and sang at La Casa Bonita at 21st and Sheridan. My all-time favorite was in Arlington. Called "La Tapatia," it was owned by gringos but everyone and everything else was Mexican. The owner's son made the statement once that Mexican food was the most profitable food on the face of the earth! And he was right. Done right, one of the most enjoyable. Comments: Had my first non-home-cooked tamale in Westchester, IL at a drive-in that is long gone - was on a bridge access that is now a cloverleaf. Some company was selling tamales to butcher shops in our home town when I was a kid and Mom steamed them at home. She had taught in Monte Vista, CO in circa 1941 which was a railroad town with a large Spanish-speaking population and she grew interested in Mexican food. When we found this now long gone drive- in, tamales were the only non-burger item on the menu and I think you got 3 tamales for a $1. I still dream of El Chico in its prime in Tulsa! Comments: Purple Overdose is a "psychedelic dream pop" band featuring Lee Woodward's son Merritt "The Ferritt" Woodward on lead guitar. Their song "Steal The Sun" has been nominated for "#1 power pop song of 2002" on Popbang Radio. The song (and others) can be heard at this link on MP3.com. They are a talented group...check them out. From their communique: "The Dose" would be extremely grateful for any assistance from our friends and family. Simply click on this link Popbang.com and scroll down to the yellow box and submit your vote for Purple Overdose - "Steal The Sun". Comments: Tacos exotic in 1972? Finding a taco in San Antone in 1956 and wondering how to pronounce it? Where was I during the forties when Little Mexico was on 18th Street, just north of Quaker Drug? Or La Hacienda, out by TU, or a half-dozen other Mexican places whose names, after these many years have escaped me. It was in these establishments that we first learned of Dos Equis, where we discovered that we could fill up on tacos and "combo platters" and have a cheap date. Mexican food was one of the signal pleasures of growing up in Tulsa and the surrounding area. Tamale men roamed the streets in nearly every town of any consequence. It was only when I got to New York, in 1951, that I found that tacos were exotic,that the Manhattan phone book listed only one Mexican restaurant, La Mariposa, and it was a dog. What can I say? I guess I led a sheltered life in T-town. Comments: I remember going to the Dust Bowl and seeing Bob Anderson play his ODE banjo when I was about 12. Dad was with me, and that may have been my first taste of "folk" music and pizza. I never had any "fast food" except an occasional Hank's, or a real treat was Norman Angel's. I remember when I was 5 in 1956 we took a trip to San Antone, and Mom, Dad, Sis & I were hungry and we stopped at a Mexican joint. Dad came back to the car & asked Mom what a taco was. It was the easiest thing for him to pronounce in Spanish. We really liked sharing the 3 delicious tacos that cost $1.00. They were no doubt larger than today's entries. Was Lea's the first pizza joint in T-town? I met Jon recently at a wedding where he was playing bass with "Sounds Good", a jazz group. Actually, I had sort of met him in 1969 when Jon was a senior playing tuba in band at East Central high school and I was a lowly sophomore third clarinet player. Welcome, Jon. Your classmate, Joy Cooper, is a frequent contributor. Tacos, tostadas and burritos still seemed exotic in Tulsa by 1971, when I had my first taste of those items at Taco Boy, just east of 21st & Sheridan. Today, we have a good selection of Indian, Thai, Japanese, Vietnamese, Chinese and Mexican...quite an improvement. Wasn't St. Michael's Alley (previously mentioned on this site, and still a coffee house and restaurant at 31st & Harvard) also a folkie place in the 60s? Comments: The Dust Bowl was a great place, had many memories and good times there. Here is a piece from the Dust Bowl that used to be on the tables. Thanks, Carl. Read Larry Kraus' piece below about this folkie hangout of the mid-60s in Tulsa. I threw in the ad from Lea's, since the Dust Bowl has it on their menu. Thankfully a promoter never picked up this show and it never was played.....Gene Simmons would have set that low ceiling on fire for sure! By the way, what ever happened to the numerous seventies promoters like Stone City Attractions, Beaver Productions, Concerts West.......? Comments: I just wanted to point out to the viewers that Gary Elliott, pictured in this current guestbook performing at the Appollo, has also provided us audio for at least the past 11 years on KTUL's morning show. Thanks Gary for the solid walls of sound!!! Comments: Speaking of the Tastee-Freez, the one on 11th near Yale still exists. I used to get those great shakes there in the '50s, perhaps even the late '40s. The strange thing about the place now is that it is closed on weekends, unless they have changed their schedule recently. Comments: I especially enjoyed reading about "Mazeppa" and Lee Woodward is a longtime neighbor of mine. Comments: I was sorry to hear about Lawrence Heatley. He and I worked a lot of weekends together. He was a good guy. Comments: Regarding the Kiss show, although I wasn't there, everyone at school the next day said that for the last encore, Peter Criss came out to sing "Beth" to taped orchestra and someone in the crowd lobbed a Jack Daniels bottle into his drum kit. Outraged, Criss shouted something to the effect of "F*** you Tulsa! We're never coming back here" and stormed off the stage. Concert over. It seems like they played in Tulsa again however without Peter Criss. Comments: Was curious to know if any one recalls or has any kind of memory regarding the KISS concert on 1/6/77 at the Assembly Center in which drummer Peter Criss was struck by a beer bottle thrown from the audience....what's the story? 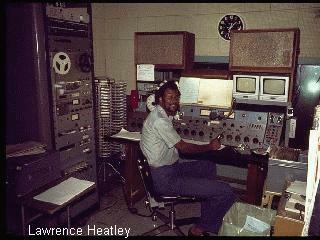 "You were asking the question, where is (former KTUL audioman) Lawrence Heatley? He is in Crown Hill Cemetary in Tulsa, Ok. He had an accident...in Texas while cleaning his gun in the 1980's...". She said brother John Heatley is still in the Tulsa area and doing well. Comments: The Dust Bowl was a folkie place on 15th street, just west of Peoria. It was open in the 1964-1967 time frame, although those dates are approximations. The house group was called the Folkmen and consisted of Robert Anderson (5 string banjo), Moby Anderson (bass) and Pat Grahm (guitar). I can still remember the night that the Folkmen returned from a tour shortly after Dylan released 'Highway 61 Revisited.' Everyone was aghast that they were playing electrical instruments. Unfortunately, they were using the electrical instruments on their standard repertoire and it just didn't work as well. As I might have mentioned previously, the only person I can remember being thrown off the stage at the Dust Bowl for singing 'inappropriate material' was Richard Roberts. All of us pushed the boundaries a bit, but Richard apparently went way over. Of course, he was younger then. Thanks for jogging another old memory. Comments: Governor-elect Brad Henry's inaugural ball will be held in the lobby of the Mayo Hotel this evening. The Mayo has undergone major renovations in recent months. The complete story and photos of the Mayo lobby today are at www.ktul.com. Comments: Your site brings back a lot of great memories. 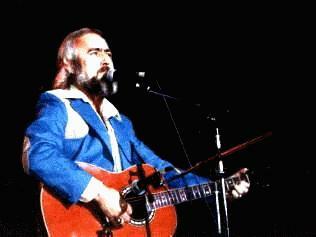 I left Tulsa in the late 70's. At that time, my favorite hang outs were Cardo's, Boston Ave. Market, the Nine of Cups and, of course, Arnie's. I heard that Arnie's was forced out of its old location. Are the other places still around? Anybody remember anything about a folk music club called The Dust Bowl? Comments: Lovely article on page D-5 of today's Tulsa World about actress Blaire Chandler. Besides being my former stepdaughter and half-sister to my daughters, Blaire should be remembered as "Blaire Stevens" on KMOD in the 1980s. She is also the daughter of Mariellen Smith, who has been mentioned in these pages several times. A short film, "Good Night Valentino", starring Blaire will soon make its debut at Sundance (and possibly later, the Sundance Channel on cable). It's based on a real-life meeting between silent film matinee idol Rudolph Valentino and acerbic newsman H.L. Mencken. Comments: Seeing the photo of Don Woods took me back to 1968, when I was a mere lad of 17. I worked at a gas station at 41st & Yale, business was slow, but Don Woods drove in for gas. I didn't recognize him until he got out of the car. What a celebrity and I was seeing him up close and personal! My mind was racing, wanting to tell him how much I liked his weather report, Gusty cartoons, etc., but all I could get out was a short sentence on the weather. He politely answered with a one-liner. I then said, "you probably don't want to talk about the weather when you're not working, do you?" He looked at me, smiled, and said, "you're the first person that has told me that and I appreciate it." Thanks, Steve, added your anecdote to the Weather page. 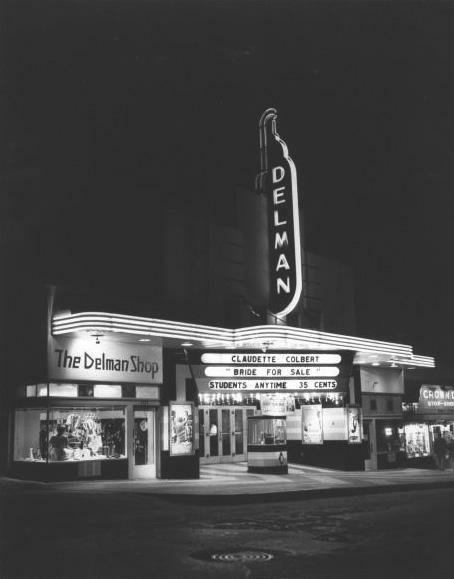 Comments: Speaking of the Delman, is my memory correct but didn't there used to be a Frederick's of raunchy lingerie fame next door? Seems like I can remember standing there gaping and open-mouthed over such stuff...and I'm a girl! That was Massad's, of which Mr. Bagsby spoke. It's still there! Comments: The Appollo Theatre...saw the Jungle Book there when it opened. Played there years later when it was the Appollo Delman. They used to have a talent night in the bar in front. Upstairs enroute to the balcony, they had a gigantic album sleeve reproduction of the Genesis LP, "Seconds Out". I know for a while they had a lot of good bands come in...Chuck Berry, Renaissance, and loads of others. Definitely a high point in Tulsa for a while; plus the added bonus of Massad's on the corner there too. I wonder how many car wrecks were caused by their display case. 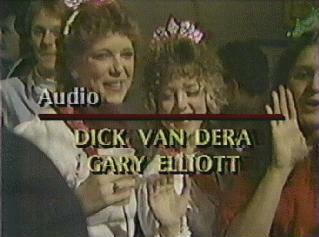 Comments: My friend Gary Elliott played the Appollo Theater 24 years ago or so. If I find a photo, I'll send it your way. Gary played some music there when he was working at KVOO as a DJ. 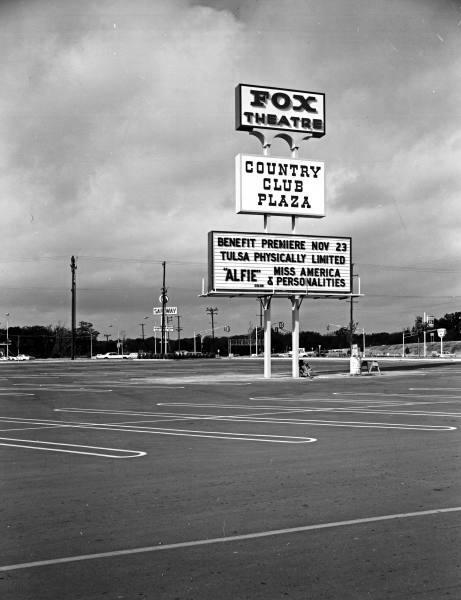 Comments: The most useless and forgotten memories of an era long lost in a town whose heyday ended with the death of the "restless ribbon" and The FOX theatre (among others... let's not forget The APPOLLO). Can I... stay... forever? Best site I've seen in a long time! 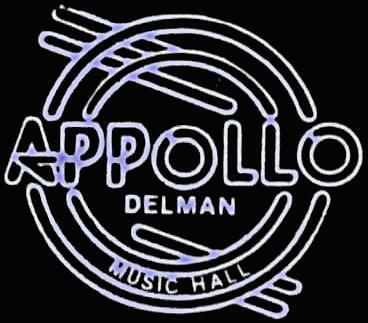 Thank you...the old Delman theater was converted to the Appollo Delman Music Hall in the late 70s. I remember seeing Randy Ess and the Invisible Band open for Henny Youngman there. I still have a postcard with the logo, which I added below. "2001: A Space Odyssey" premiered at the Fox in 1968. Logo on my postcard from the Club Appollo, late 70s. Comments: My son in Seattle was surfing the net and came across your website. After graduating from art school in NYC in 1955, I went to work for WSAV-TV in Savannah, GA as staff artist. Tom Belcher, who was from Enid, was our sales manager (this was a start-up station). Subsequently Tom left, went back to Oklahoma, and joined KVOO-TV. I got a call from him late one night. He said the artist at Channel 2 had committed suicide and would I take the job (gasp!). I did, joined the station January 1957 and stayed until 1960. By the way, Bob Harvey, who later was an announcer at Channel 2 was also on the staff in Savannah. Comments: About the movie "The Outsiders": at that time, the school was the Jr High., not the High school. The undisputed best all-around search engine, Google, has a Toolbar available for download. Once installed, it becomes an integral part of your Internet Explorer browser (it is removable, too). Let's say you are looking for all comments about Leon McAuliffe, for example. If you put "McAuliffe" in TTM's own good search engine, you will find all pages on the site that mention him. But most of the Guestbook pages are pretty lengthy, and finding specific words within them can take awhile. However, if you type "McAuliffe" in the Google Toolbar and search the internet once, you will then have a temporary "McAuliffe" button. Now, once you use TTM's search engine to get to a specific Guestbook page, just click the toolbar button to easily find each mention of "McAuliffe" on that page. Comments: Saw Leon Russell last night in Kansas City...it was fantastic! Got to see the Tulsa show recently opening for Joe Cocker and despite what a certain reviewer for the local paper said, he was really cooking on that one also. Makes me glad to be from Tulsa. Comments: It was quite a blast from the past to see that KGCT Channel 41 logo on your home page. I still have my green 41 Live! jacket with that logo on it. One good thing about Channel 41 was that it was connected in the back to the bar/deli next door. Half the time when you couldn't find someone they were next door enjoying a cocktail. Comments: The Tastee-Freez that played a part in the movie The Outsiders was located on the NorthEast corner of Main and 86th Street North. Sadly it was torn down years ago. I miss eating there after school the owners were some really great people. The bleachers that appear in the film is Ator Field which is still in use for football (not high school football though). I am sure I have a picture of Tastee-Freez somewhere. I have a year book that has a couple of pictures of some actors and the Tastee-Freez owner. I was able to stand across the street while they were filming that scene. Other scenes were also filmed in Owasso. See an old Tastee-Freez at the Tastee-Freez web site. Comments: Regarding Erick's question, "Speaking of The Outsiders, I've been getting an itch to see a movie at the Admiral Twin. Anyone know when they start up this spring?" The Admiral Twin is run by the same folks who now run the 6-screen theater at Eastland Mall. I'll bet you can find out by asking the manager there. If I remember correctly, the Admiral Twin usually opens around Easter weekend. Tina Ervin-Platt of the Admiral Twin will give us an update when she has a definite date. Comments: Someone in the last guestbook mentioned needing to know where there Dairy Queen/Tastee Freez used in The Outsiders was located. As they mentioned, it was in Owasso, just across the street from Owasso High School. I don't know the exact location in proximity to the school, but that should help. Speaking of The Outsiders, I've been getting an itch to see a movie at the Admiral Twin. Anyone know when they start up this spring? Location: Fairfax, Va, about 250 miles north of Lizard Lick, N.C. Comments: Congratulations on four years of Tulsa Television Memories. May the brain dumps just keep comin'. New slogan for 2003: TTM...All Bran for your brain. Comments: Happy New Year and LONG LIVE TTM! I am working on US coverage of the Paris to Dakar race car/truck/motorbike marathon that kicked off today. Watch it on the Speed Channel on cable in Tulsey. This year it goes to Egypt - not Dakar - on a new and neat route! On a game site on eBay - one of my co-workers noticed a game site seller in Tulsa - by TU - selling the 2003 Dakar race game. Have any of you ever heard of Box Builders Inc. at 1716 S. Gary Ave. Tulsa, OK 74104??? Comments: Congrats to Mike on 4 years of TTM and Happy New Years! Comments: Mazeppa was so funny! I was so glad to see a good copy of the poster from the Tulsa State Fair. My wife laminated mine before it could fully crumble. I bought "Scope Them Turkeys Out" at Greer's on the way to Der Weinerschnitzel and married my wife because she had an 7-Up Underground card. I caught Gary Busey on drums with Teegarden and Van Winkle at Magician's while Gailard hooped and hollered from the bar. They were headlining for Don Preston that night. It was a cool time in T-Town. Were you e-mail deluged on micro radio-controlled race cars for sale this year? They were selling from as low as $8 each to $35 if you bought them on-line (stupid!). Seems to be the TV MAGIC CARDS of 2002. My brother and his neighbors bought some at Dillons in Wichita and found them to be the ideal cat toy. Cats - unless extremely lethargic - go crazy chasing them on the wood floors. The motor noise drives them wild. They tackle them and pounce on them - however they found that dogs have a tendency to EAT them. Problem with dogs is a potential choking on small parts. So if you have a bored cat at home - pick up a micro race car for his/her amusement! Comments: During one Christmas seasonI believe it was in 1954---there was a short Christmas pageant that was performed on the balcony of Brown-Dunkin department store on Main Street. Our former Central High School speech teacher, Isabelle Ronan, directed it, and KTULs Ed Neibling was the narrator. Compared with the massive and extensive Easter Pageant, it was a minimal production. It was presented on a small space, with minimum of music and of fairly short duration. I think we only performed it a couple of times or so in the evenings. I played the part of Joseph. Actually, there was no performance involved. I merely stood beside Mary with my hand on her shoulder. (Miss Ronan remarked later that this was the first time any of her Josephs had played the part while touching Mary.) Bob Griffin, who was still at KAKC, I think, was also in the production. Additionally, there were three spectacularly beautiful blonde girls from Central who played parts of the angels. Looking at them, I thought I had died and gone to heaven already. It also made me think that I had graduated from CHS a few years too soon. Comments: Glad to hear via Mike Bruchas that Landecker is still on the air in Chicago. I remember well his WLS days -- the boogie checks, "Make a date at the Watergate," etc. And it's all there for you to hear again on a WLS memories site at http://MusicRadioWLS.musicpage.com/. It's a frame site, so when you enter, go to the left frame and click on "WLS airchecks" and you'll find links to several minutes of Landecker as well as numerous other WLS voices of the past. This is an excellent site, with links to many other radio sites. Just in case you haven't seen it, here is your 2002 TTM Christmas card. Happy holidays to everyone! Back to Tulsa TV Memories main page.